Daisy the Doxie is 2 Today! She's the BEST LITTLE WEINER DOG IN THE WORLD!!! And today is her birthday! So I thought I'd share a few (LOL) of my favorite pictures of her. Day 1 - Meeting the family! Isn't that the cutest thing you've ever seen??? (The puppy people, the puppy!) But yeah, hubby's pretty cute too, LOL! WHY do I have to wear this momma - I can swim! It's a rabbit, a fish, wait... a Dog! I got it, I got it!!! At the Vet - looking a little scared! At our new house. She loves being anywhere we are... ESPECIALLY if there's a blanket! How could you resist those eyes??? I can't! Bubble Princess in the bathtub! Sleeping next to me in the bed! 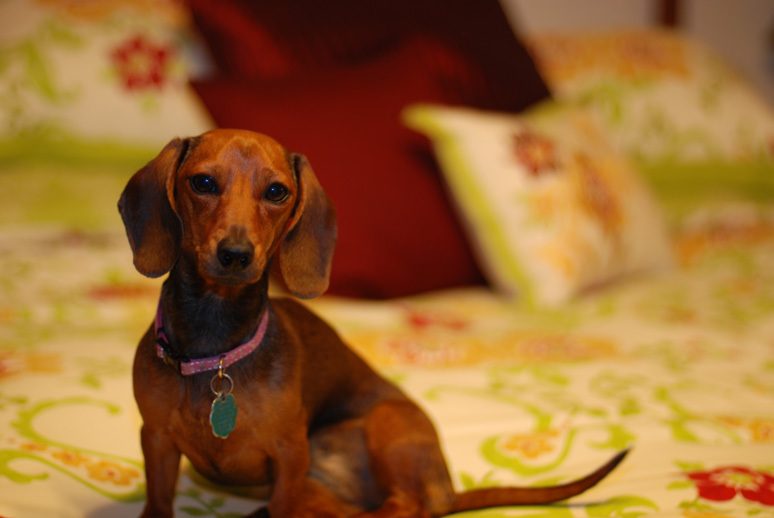 Daisy is simply the best weiner dog in the World! Have I mentioned that lately??? Hopefully you won't get tired of hearing about her because she really is such a joy and makes myself, and my DH, laugh every single day! If you know anything about dachshunds, you know that they are cold natured and love to snuggle up in blankets and specifically, in your bed between two warm bodies! I'm not saying she sleeps with us every night, but it's pretty frequent, LOL! Even when we get up in the morning, after she goes outside for a quick potty break, she wants back up in the warm bed...even after I make the bed! Well yesterday Mr. H left very early (5:30am on a Saturday???) with son Keaton for a quick overnight boys 4-wheeling trip to a new place they haven't been yet called Mud Buddy's. I went ahead and got up too and made us some delicious coffee with my beloved Keurig single cup, and went about my day. I started looking for Daisy some time later and pretty much knew she had to be in my bed! So I went in there, camera in hand, to see if I could "catch her". Below are some of my attempts as I walked into the room (facing the windows) and you will see that they are just not lit very well (images 1, 2, 3). So I moved her to the other side of the bed, directly in front of the windows, and shot from a couple different angles (images 4-8). Now doesn't that make a huge difference? My camera is on manual, on the very same settings for both groups of images. No flash at all, just window light (Camera set on Manual, ISO 800, F2.8, 1/60, 50mm lens). I just love image 4 - she looks so sweet! I know if she was human she would look at image 6 and say "Mom - this is so unflattering, I have 3 chins!!!" I guess even dogs have a bad side! Image 7 is her "OK I'm so done taking pictures face"! 1) move around and try different angles - if you look at your image and it's not what you were looking for, change your angle. Get down at their level, move around! I'm submitting this as my Mosaic Monday post at the Little Red House blog - check out all the weekly cool mosaic posts from readers everywhere! Ok....I couldn't resist!!! The "Halloweenie" idea came to me this morning when I was thinking about what to enter in the MCP Actions (www.mcpactions.com) Halloween photo contest. "Actions" make photo editing and retouching in Photoshop easier and are definitely a timesaver for Photographers - I don't know how I survived before I discovered Actions but I'm glad I did!!! 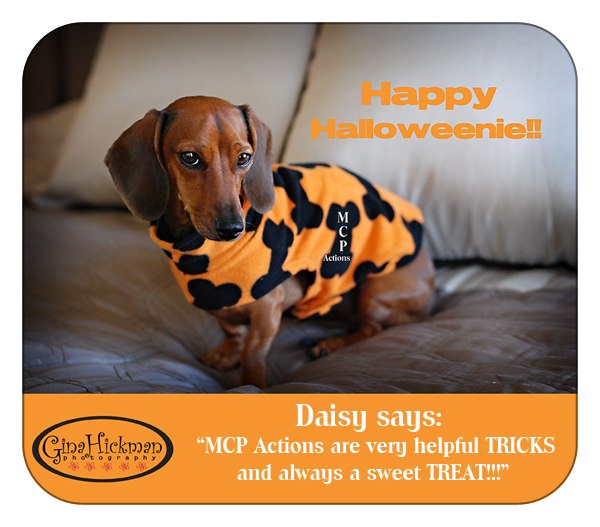 I remembered this cute Halloween fleece "sweater" that I had bought for Daisy at Ross recently, and decided I could probably get a decent picture of her and incorporate MCP Actions into it somehow....didn't it turn out cute??? 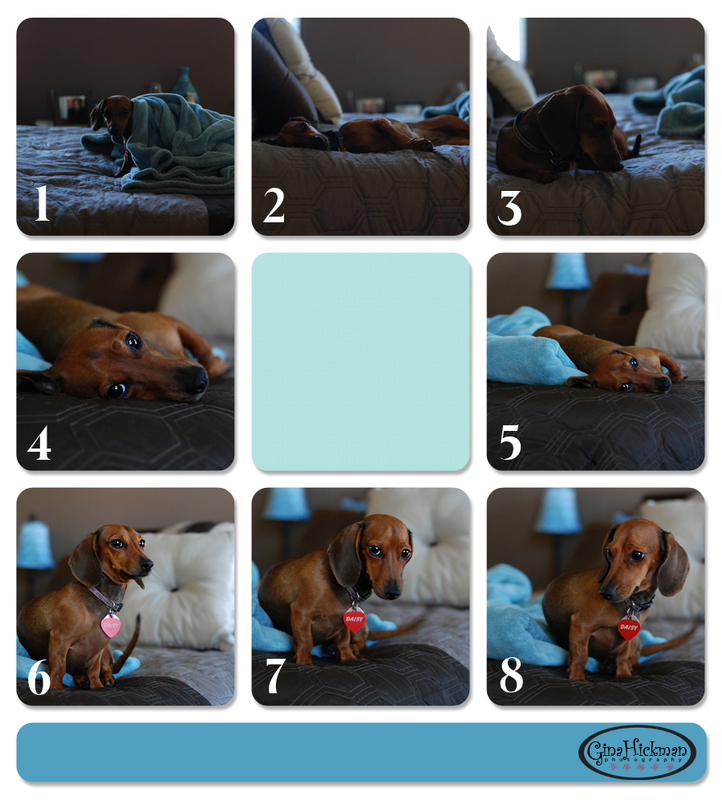 Head on over to my Facebook Fan Page and check out the Dachshund Photo Contest! They are simply all adorable!!!! 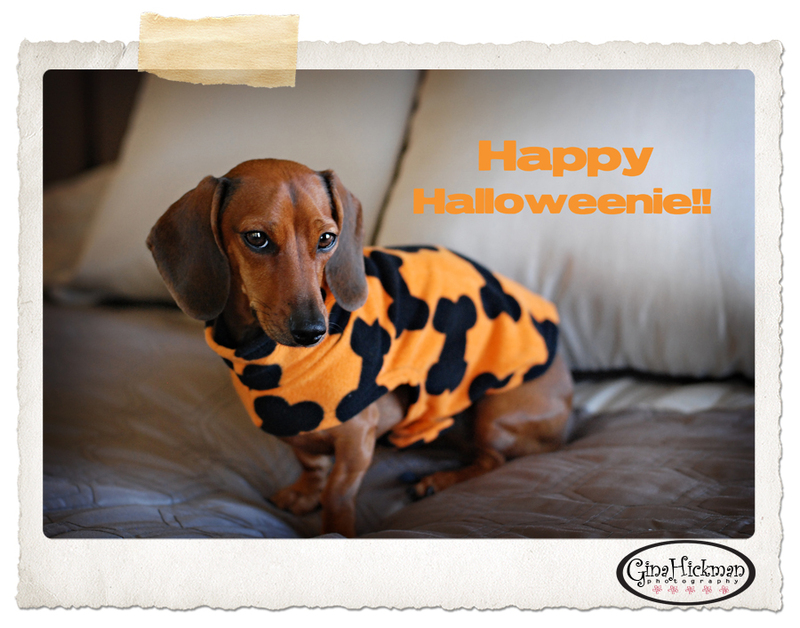 Vote for your favorite Weiner Dog during the month of September by leaving a comment on his/her photo in the "Dachshund Photo Contest" album - the Dachshund with the most comments at the end of September (1 per person please) will win a photo shoot with Gina Hickman Photography for their prize-winning pooch and will get to pick their favorite image for a 16x20 Wall Portrait!!! !